A storm system approaches: the sky darkens, and the low rumble of thunder echoes from the horizon. Then without warning... Flash! Crash!—lightning has struck. This scene, while familiar to anyone and repeated constantly across the planet, is not without a feeling of mystery. But now that mystery has deepened, with the discovery that lightning can result in matter-antimatter annihilation. In a collaborative study appearing in Nature, researchers from Japan describe how gamma rays from lightning react with the air to produce radioisotopes and even positrons—the antimatter equivalent of electrons. The second afterglow, for example, was caused by lightning reacting with nitrogen in the atmosphere. 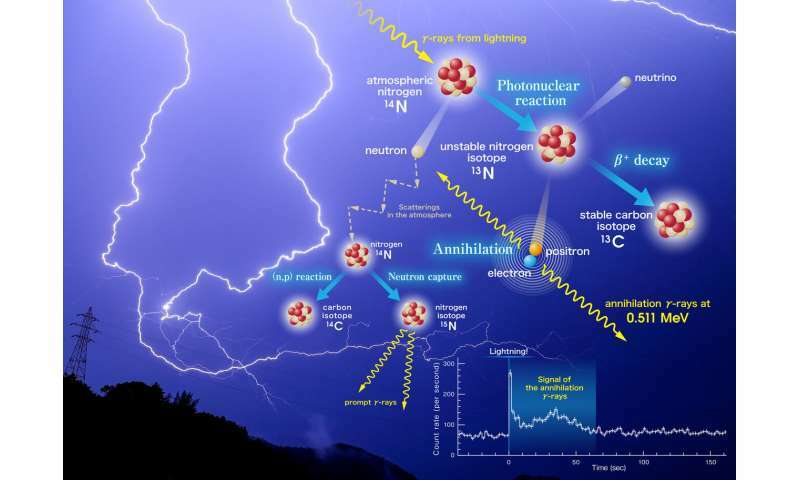 The gamma rays emitted in lightning have enough energy to knock a neutron out of atmospheric nitrogen, and it was the reabsorption of this neutron by particles in the atmosphere that produced the gamma-ray afterglow. Gamma rays and X-rays are created by electric discharge processes throughout the Universe, one of rhese days tge plasma ignoramuses will realize this fact. The gravity only guesses are outdated pre-spaceage fanciful beliefs. I was thinking you could smell the positrons after a lightening strike. Don't think I ever got that close though. Maybe it's a mixture of carbon and nitrogen isotopes. Meh, the positrons weren't created by the lightning. They were released by a nuclear process that emits positrons, nitrogen decay. Do better physorg. But the crowdsourcing is interesting. - (rhese days tge ) - plasma ignoramuses will realize this fact. The gravity only guesses are outdated pre-spaceage fanciful beliefs. So what was the cause of the beta decay in the atmospheric nitrogen? Yeah, I love the smell of positron in the morning. Any idea why this can not be done in the lab? Why build detectors all over the place and wait for a fortuitous strike? I'm sure there is a good reason. Just wondering. Meh, the positrons weren't created by the lightning. They were released by a nuclear process that emits positrons, nitrogen decay. This is in the range of photons created during lightning strikes (ground lightning can deliver some photons as high as 2MeV.). I'm not sure why the nitrogen is pictured this way in the image above. An atom is needed because of conservation laws, but not a 'decay' the way it is shown. Who would have expected nuclear processes just from particles being accelerated by the millions of volts in a lightning strike? @anti, I think that pair production would be a minority process, and in addition would result in gammas of the characteristic positron emission line, very promptly. The fact they don't seem to see such an emission line is why I think it's a minority process. It seems to me that pair production would have the effect of converting many photons to the positron emission line if it were common. But I'm not sure enough of the sensitivity of the instruments to be certain of it. So it is true, godzilla can control lightning! Well, they say they see 511MeV signals - which is a positron/electron annihilation (which you will get in either process). I'm questioning whether the originating mechanism is (exclusively) the one they claim, because you can get positron/electron pairs created close to an atom without the atom actually being involved in a decay reaction. The de-excitation cutoff they note is interesting, though and speaks of accelerated neutrons. capture lines, and (3) the positron annihilation line. Thanks, @anti, I'll look it over. I'll have a look at that too. I will point out that the timing of the various signals is crucial to differentiate the signal from positrons created by pair creation from the prompt gammas directly generated by the lighting bolt itself as opposed to positrons released by the inverse beta decays, whereas the gammas from the neutron capture de-excitation will not show the strong 0.511 MeV line. So I'm going to be checking out the methods and data in these two papers quite carefully. What I seem to be missing is, how does the unstable (13) nitrogen loses a PROTON to become 13Carbon...? Isn't it just NEUTRON decay? @Whyde, it's called inverse beta decay. A proton emits a positron and an electron neutrino and becomes a neutron. It's not a common decay path but if the energy levels are right then it's a possible one. Wikipedia has an article on it, or at least a mention and a quick search will turn it up. @Anti, your quote does not refer to lightning. It refers to GCRs, which are galactic cosmic ray showers. In fact I don't think that paper has anything to do with lightning at all. What produced these positrons and how? A potential scenario is that electron-positron pairs are produced by high-energy gamma rays in the electron acceleration process. However, the lack of detection of high-energy seed gamma rays (>3 MeV, Fig. 3a, b) rejects the scenario. In addition, the environmental electric field measured on the ground was upwards during the annihilation signal (below ∼−3kV m), and hence positrons should not be accumulated towards the ground, and the annihilation line should not have been enhanced. In addition to all this, as I argued above pair production positron emissions should be nearly as prompt as the gamma from the strike. This is because the gamma rays emerging from the strike will move at c, and positrons from that will not have a long mean free path before finding an atmospheric electron to annihilate with, emitting a 1.022 MeV gamma (the authors make the mistake of forgetting that the positron gamma is at this energy, and I did above too- realized it this time) which will again move at c. This would create an enhanced prompt 1.022 MeV signal which is not observed. By the time a microsecond has passed from the strike, the gammas are a thousand feet away, more or less. By the time a millisecond is over (which is the timescale they call "prompt") the gammas are two hundred miles from the strike site. An event associated with 0.511 MeV emission, similar to the event reported in this paper, was once detected previously at the same site on 13 January, 2012, after a pair of positive and negative discharges... since the electric-field monitor was not working at that time, we were unable to eliminate the pair production scenario entirely. ... In contrast, in the event reported in this paper, we measured the environmental electric-field... using a commercial electric field mill BOLTEK EFM-100, and found it to be negative during the delayed (annihilation) phase, which implies that electrons moved to the ground away from negatively charged clouds, and thus generating the 0.511 MeV line without emitting 10–20 MeV bremsstrahlung photons is impossible. I'd say pair production is ruled out, and they were aware of the possibility and collected the data needed to do so. I note that they also said 0.511 MeV again instead of 1.022 MeV. Since the positron and electron each have a mass of 511 keV the corresponding energy of the gamma photons produced upon their annihilation will also have the energy of 511 keV (given that 2 photons are produced as is most probable). Conservation of energy and linear momentum forbids the formation of only 1 photon in the event, so a 1022 keV photon will not emerge from the annihilation process (it is possible that more than 2 will be produced, though this is improbable except in some special cases). Err, since the electron and positron each have 0.511 MeV of mass the gamma they produce by annihilation must have 1.022 = 0.511 x 2 MeV. The path for the momentum is obvious. It's trivial to produce a single summary vector from two vectors. If you have enough quantum mechanics to show some actual scattering math to support your rank speculation about two gammas feel free to share it. I ain't holdin my breath. Err, since the electron and positron each have 0.511 MeV of mass the gamma they produce by annihilation must have 1.022 = 0.511 x 2 MeV. They produce two gammas with 511MeV each (since you need to have conservation of momentum). Dang it, you're right @anti, my geometric intuition always betrays me on that one. Thanks man. Jokingly, Mothra has poison and hurricane winds with a strong right-wing uppercut. watch the movie Space Godzilla for reference. but as to the article, this seems to connect to space particles triggering lightning. First, we must distinguish lightning from the thunderbolt. Lightning arises in the atmosphere in the collision of two opposite charges, where a higher electrical voltage is discharged at a lower voltage. With such a rapid movement of electrons through the air, an electron collision with air molecules occurs. External free electrons collide with an electronic coil of chemical elements in the atmosphere, where the electronic shell is removed from the nucleus and protons and neutrons remain. Now electrons are released from the neutron and new protons are formed, which with the existing protons have a higher positive charge of the nucleus than the electron around. Then there is an explosion of the nucleus from the proton and they are released from positrons, which enter into the reaction with the external electrons - the filaments, where the photons are formed, and the radiation and the gluon plasma is formed. At that passage of lightning, there is a vacuum and there the air enters, which causes the thunder-crash of air between one another. This is an event that scientists are eagerly waiting to say that it is an antimatter. There is no antimatter, there are only anti-charge particles.